Here is a picture of the Awareness Wrap that hit stores today in Canada. The colors it comes in is Plum/Seaspray/Black Roses Print, Coal/Lilac Roses Print and Black/Whisper/Black Roses Print all pictured bellow. First report on Facebook is that the sizing is the same as the Gratitude Wrap. I take an 8 in the Gratitude Wrap but it’s wide at the bottom so I don’t have to make accommodations for my hips. When I tried on the Savasana Wrap a while ago in a size 10 it stayed open at the very bottom because of my wider hips. I really hope this one fits more like the GW for me because I love the look of this wrap. A lot. I was worried that I wouldn’t when I first heard it looked like the Savasana but to me it really looks like a blend of both. Like someone on FB said, it looks like Savasana and GW had a baby together. I love the very large hood, the two tone, The ribbed arms and the streamlined front with no buttons really showing. I think the neckline and pockets keeps the front from looking too plain. I still hope to see a return of the Gratitude Wrap as it has a really lovely neckline and many options for how to button it up. I also love the double breasted snap buttons on it and the ribbing detail at the elbows and back. But this wrap is pretty cute. I think I’m much more a wrap person than a hoodie person right now. * The inside scoop is that the Coquitlam store is for some reason not receiving these wraps. Or at least not this run of them much to the disappointment of the educators at that store who were looking forward to trying them on.There may be more colors coming at a later point that they may get but they are not on the list of stores receiving these which means it’s a limited release item. 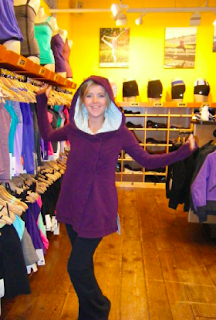 This is something that happened at the Oakridge store with the first run of Inspire Pullovers and some other stores with the Wear With All Jackets in Pig Pink, Clarity Grey and Snorkel Blue. I’ll be grabbing one tomorrow (not sure yet which one) and depending if I love it I may get another color of the next run of colors (if there is one). "The Cuddle Up Jacket & Coal Pique Pants (super soft)"